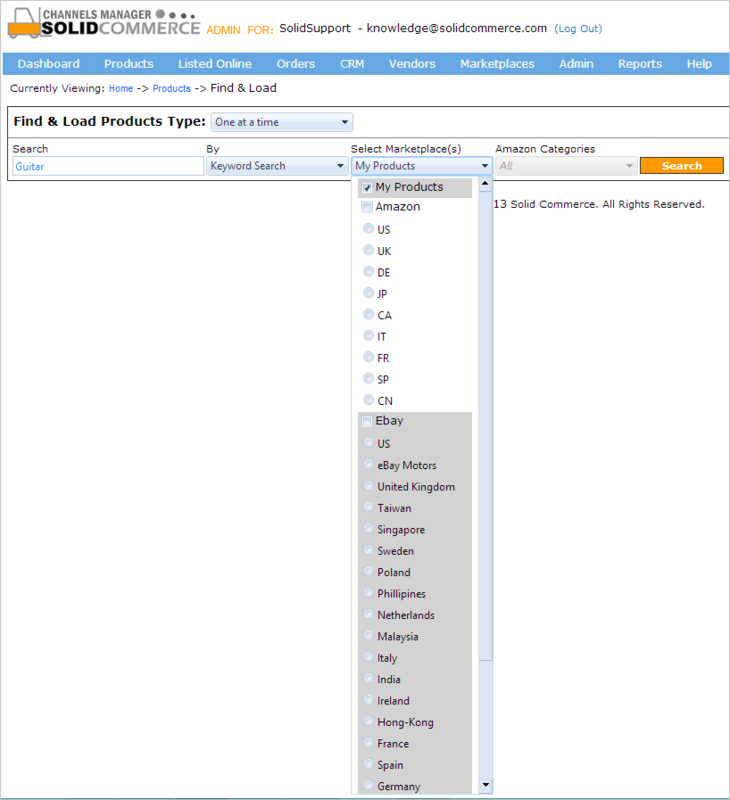 The Find & Load Tool is a powerful tool that makes adding new products to Solid Commerce easy. It allows you to search the marketplaces by keyword or UPC. We automatically import the marketplace data into Solid Commerce. Simply add a quantity and price and you are ready to save your new product in a Warehouse and list it to the marketplaces. From the Products Menu -> Find & Load. The Bulk option is currently in development, and not fully functional. For now, keep One at a time selected in the Find & Load Products Type drop-down menu. Below we will explore each one of these steps and show how they work together in the Find & Load Tool to help you create items and quickly push those items to the marketplaces. One of the powerful elements of the Find & Load Tool is that it has advanced search capabilities. The "Find" portion of the Find & Load Tool allows you to search for a single particular item by keyword, UPC and other options. Products Menu -> Find & Load ->Find and Load Products Type drop down ->> Select One at a Time. In the Search field, enter the Keyword, UPC, ISBN, EAN, or ASIN of the item you wish to find. You may use a barcode scanner on the item's bar code to search by UPC. Select the search option from the drop down menu. Choose the area(s) where you will search for the item in the "Select Marketplace(s)" drop down. My Products - Check this box to search products you have in your Solid Commerce account. US, UK, DE, JP, CA, IT, FR, SP, CN. At this stage, you may also filter the Amazon Category through the options available in the Amazon Categories drop down. Selecting an Amazon Category will increase the speed of the search. US, eBay Motors, United Kingdom, Taiwan, Singapore, Sweden, Poland, Phillipines, Netherlands, Malaysia, Italy, India, Ireland, Hong-Kong, France, Spain, Germany, China, Switzerland, Canada, Belgium Dutch, Belgium French, Australia, Austria. The Select Marketplace(s) field will support checking multiple options. They will display in the drop down as comma separated values. After you have refined your search ->> Click on the Search button. Allow the search to run. Now that you have found your items, you are ready to Select product data from the results. After you have created your search, a Results page will appear. Click the Select button to display an item's Product Details. Here, you can manually edit product data such as Weight, Dimensions, MSRP, Main Image URL, Description and more. Custom Product Attributes cannot be edited in the Find & Load Tool. Once you have edited the Product Details, click Save This Product to update the edits you have made to the item. 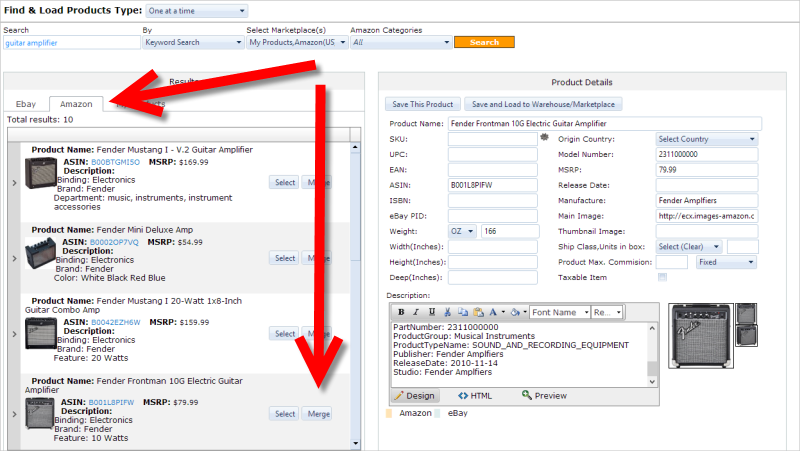 This is a fast option instead of searching for and editing item data through the Products Manager. However, nothing compares to the Merge function for updating product details. The Merge function of the Find & Load Tool makes it easy to build up your product data with information available from listings found on eBay or Amazon. Find the desired item using the Find and Select steps above. In the results area, switch between the eBay, Amazon, and/or My Products tab to view Results. Select an item from the eBay or Amazon tabs and compare the data to your item. When you have reviewed item details from the eBay or Amazon tabs, and you are satisfied with the description, click Merge to apply the eBay or Amazon details to your item. Solid Commerce will populate the empty fields of the item to the Product Details in the My Products tab. Solid Commerce will create the product if it it does not already exist in your account. Click on the Gear Icon to assign a SKU to the item if the item did not already exist in your account. Click on the "Save and Load to Warehouse/Marketplace" to save the edits you have made. A pop-up will let you know that the product was saved successfully. To confirm that the item was created or updated, you may open a new channelsmanager.com window and view the item in your Products Manager (Products Menu -> Manage Products). Now, you may now continue to Load the product to a Warehouse or Vendor List, and then to a Market List. Once you have Merged the eBay or Amazon data to detail your item, you can load the item into a particular Warehouse or Vendor List. Choose a Warehouse or Vendor List from the Add to Warehouse/Marketplace(s) drop down. Update Warehouse ID, Add Qty, Stock Note, Storage Location, Product Condition. Click the"Add Qty to Same Location" button if you only want to update the quantity. A pop up will tell you that the item was added successfully. Click Add to New Warehouse if you want to add the product to a different Warehouse. This will assign a new Warehouse ID to the SKU. Click Add to Market List if you are ready to set up the listing. Select the Marketplace, Market List, Listing Template, Listing Rule, Quantity, and Sell Price Exp. you wish to apply to the item. Use caution when setting the Automation! Solid Commerce saves the last listing parameters that were applied. Review, and if your listing parameters are correct, click the green Add to Marketplaces button. A Success message will appear in the Results column. The item will list to Amazon directly and by-pass this step. The product is now ready to be purchased on Amazon, your webstore, Sears...? To push the item to eBay, you will need to edit the Listing Template and Listing Rules as outlined below. Once you have Loaded the item to your eBay Market List, and you have clicked on the "List Now" gear icon, you will be prompted to edit the Listing Template and Listing Rules. Expand the Listing Template and edit as desired. Click the "Save Changes" button or the "Save and List to eBay Now" button. A List Items to eBay Now pop-up window will appear. Edit the Listing Rules in the pop-up as desired. Click the List to eBay button. A pop-up will tell you that the item has been listed successfully. Your item will now be listed on eBay thanks to the speed and efficiency of The Solid Commerce Find & Load Tool.